JACKSONVILLE, Fla. - The world's largest crowdfunding festival is now open in downtown Jacksonville with many of the One Spark creators setting up their booths Tuesday, ready for full display Wednesday. Most people aren't a fan of chaos, but for 29-year-old Sammy thrashLife, it's the perfect method for his madness. "I don't have, like, an idea for a specific image. I just kind of, like, push a color around and if I see something in it, usually I just turn everything into a funny face because that's what makes me smile," thrashLife said. And it's through his art that he tries to make others smile. "I hated it at first. Didn't want to do it. And then eventually something clicked, then I was like, OK, maybe I kind of like this. This is kind of fun," thrashLife said. thrashLife isn't just an artist though, he's a graduate of Georgetown Law School. He started painting two years ago after being released from rehab. "I started shooting heroin when I was 18 years old and I've been out of my mind. I've been in therapy since I was four. I have borderline personality disorder," thrashLife said. But that disorder and his addiction haven't held him back; in fact, they pushed him forward. 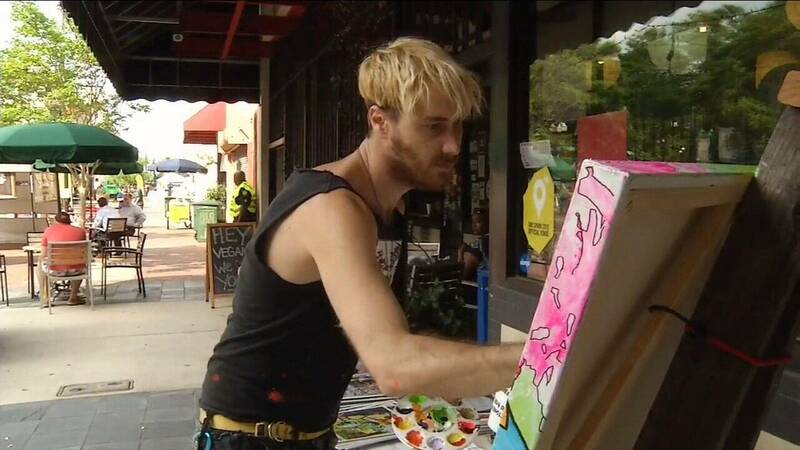 thrashLife made his debut at One Spark last year and sold more than $3,000 worth of paintings. "These are just the stories of my life. I'm out of my mind. So I'm always flipping out about something and then I have to paint something to bring myself back down," thrashLife said. "It's absolutely my new drug. It's much better. It doesn't hurt as bad as heroin. The consequences are much brighter."